Slide! is the laugh-out-loud true story of the greatest collapse in baseball history, told from the perspective of a boy who lived it. The Philadelphia Phillies’ bid for the pennant in 1964 was an almost flawless run. With twelve games to play, the team’s lead seemed insurmountable. For 11-year-old Carl Wolfson, it was the happiest summer of his young life. Then the unthinkable happened. With each late-season loss, Phillies fans were thrown into despair, and Carl’s crumbling dream of a World Series forced him to take refuge in comedy. Luckily, it was all around him. His bickering parents (who put up Chinese symbols for “peace” and “happiness” and argued for years about which was which), his grandmother (who was so stubbornly Republican that she refused to carry a Roosevelt dime), and his mouthy great aunt (whose protest letters to the Phillies front office became local legend) created plenty of opportunity for distraction. This coming-of-age tale unfolds with the backdrop of President Kennedy’s assassination, the stormy Goldwater-Johnson campaign, the civil rights struggles of the early 1960s, and the (hilariously hyperbolic) height of Communist paranoia, creating a nuanced picture of what life was like during that tumultuous time of national and international change. 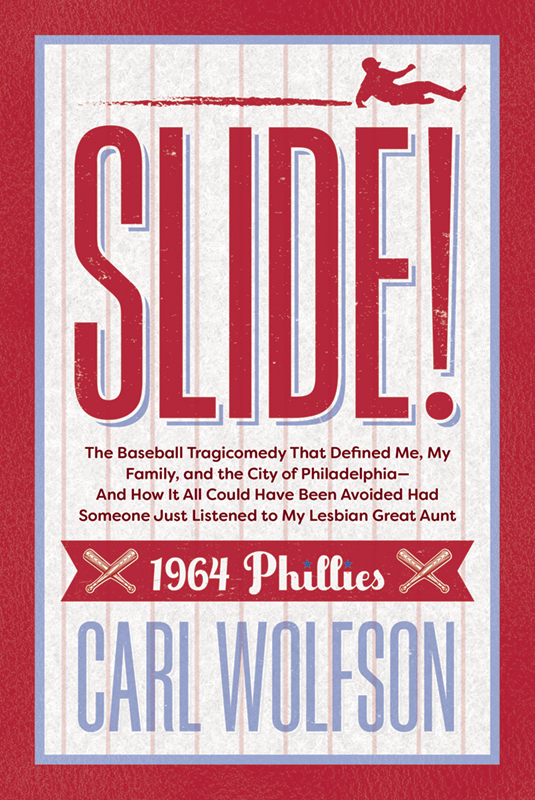 A universal story of hope and heart and a finely crafted homage to childhood, family, and our national pastime, Slide! is essential reading for Phillies fanatics and fans of any team.